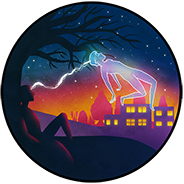 ‘Vibrations’ are a much talked about subject in Astral projection, especially the Monroe method. ‘Vibrations’ usually refers to a period in an astral projection attempt when physical sensation of the body changes from your regular state (think of how your body feels now, reading this) to a more aware, tingly feeling. It has been stated that the vibration stage happens every night just before we lose consciousness. Personally, I wouldn’t describe them as vibrations, but more of a blended feeling where your body and whatever you are laying on start to merge. The actual feeling is different for everybody; it can range from tingling, like when you have numbness, to a more inertia driven state of disorientation. The vibration stage is the final stage that happens before a successful attempt. It is from this stage that you separate. It’s important to remember a few things about the vibration stage. Firstly, that you can control these vibrations mentally. They are a mental event and something you can stop, slow down or increase. Many techniques suggest enhancing these vibrations, and then a separation will occur naturally, with little effort. Secondly, there is no time limit or rush here. You don’t need to do things as quickly as you think you should. This is a state that can be maintained indefinitely. I used to get caught up rushing through them and spoiling the whole attempt. Take your time and realise these are the feelings you will feeling you wish to attempt astral projection. Finally, remain calm, if you start to get agitated or worried, then the process will slow down and stop.